Lots and lots of smaller blocks increases metadata, larger blocks have less metadata but can run into issues with contention. Block storage can suffer from I/O Blender issue, NFS doesn’t as each virtual disk has its own connection through the network. What are the regulatory compliance concerns? Dr J also covered the features and characteristics of block, file and object storage in details. Again, it’s worth checking out his presentation for yourself as there’s no way I could add value to what he’s already covered. However, for those that don’t know the differences I’ve added the breakdown for data suitability below. I would highly recommend watching this session for yourself. GenKey – 1620, Disruption is here, now what? Generally I’m not a fan of keynote speeches. For me they tend to drag on, are a bit over the top and try to drill up excitement into something that’s not generally exciting. 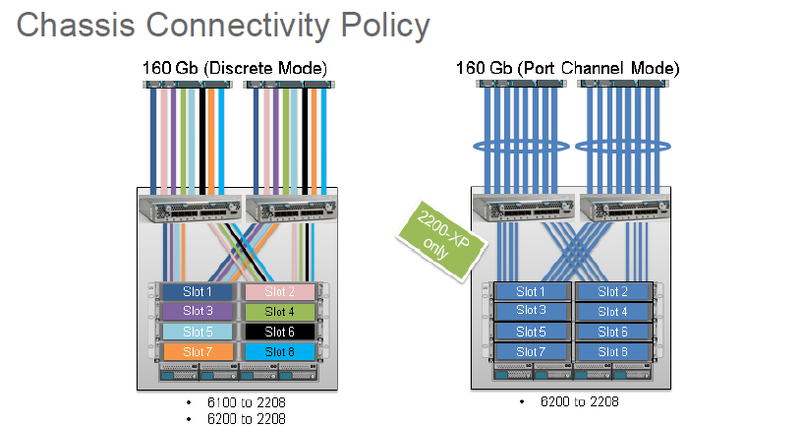 This isn’t a pop at Cisco, it’s the same whichever the vendor conference. A lot of what’s talked about is how great the company is, how they are ahead of the curve with their solutions and also a massive thanks to all the people out there for buying their products. Add in loud music and some funky visuals and you’ve got the essential ingredients covered keynotes for a tech conference. This year Cisco had John Stewart (Senior Vice President of Advanced Security Initiatives, Cisco Security and Trust) present the speech about data, data security and some of the interesting ways that Cisco utilise their technology. Without doubt the most interesting part of the keynote was around the Cisco TACOPS team that provide emergency responses to global disasters. I highly recommend checking out their site and learning a bit more. On the whole however I did find the keynote a bit of a fizzer and generally lived up to my indifference towards keynotes at large conferences. This partner session run by Citrix gave an overview of how to best use Citrix Netscaler as part of a SDN solution with Cisco ACI. It was a brief overview and while there’s wasn’t time to go into a full infrastructure design it was enough the whet the appetite and investigate more at another time. After the Citrix session I had intended on going to a few other breakout sessions but I got talking to Craig Waters from Pure Storage and all my plans for the remainder of the day went out the window. This is the job of conferences. There’s unexpected meetings which means that despite the best planned event you need to be flexible. ACI is the next big thing for Cisco and they have been pushing hard to get the message out there. I attended an ACI session about 18 months ago and wrote about that on my Cisco ACI post. A lot has changed since then and I’ve not kept up with everything so I thought a good refresher of the fundamentals was a good idea. In VMware APIC creates a new distributed switch and then maps the EPG to be a port group on the vDS. The vNIC then needs to be added to the port group. And configuration from the VM is then completed. The APIC controls the vDS. It’s not possible to edit the vDS within VMware once the APIC is in control. If you read my previous comments about keynotes speeches then you know they are not really my cup of tea. This keynote turned this view on it’s head. Susie Wei was just brilliant and gave a great run down of how we are all developers, that development is the future of IT and how now is as good a time as any to get started. Like all keynotes there was a great display and a demo of some great technology. Cisco displayed some of their new collaboration tools, IoT device management and presented to whole solution as part of a disaster management solution. It was pretty impressive. My one take-away from this event was that development is key to my career as an IT professional. Straight after the keynote with Susie Wie I jumped into a session by NetApp on their flash based solutions. I have some decent background knowledge of NetApp solutions but what peaked my interest in this session was the details about NetApp’s recent acquisition, Solidfire. There’s been a lot of confusion around why NetApp purchases another flash storage solution when they already had two existing solutions, the All-Flash FAS and the EF flash E-Series. Solidfire has been purchases by NetApp to develop not just their sales area to solution providers but also to grow NetApp outside of its core OnTap solutions. It also gives NetApp a large scale out infrastructure that has APIs at its core. There’s also been a good culture fit between the two companies. Just before the end of the session Sergei (Solidfire speaker) dropped the bomb that Solidfire is going to be rolled into the Flexpod architecture and a CVD will be out for it soon. As a Flexpod customer with NetApp backend storage this is a really interesting decision. Once NFS is ported into Solidfire and the data management features such as SnapMirror work on the platform then it’s really a solution I’ll be willing to consider dropping some cash on. This session was one I was most looking forward to at Cisco Live. It mentioned in the session details that it would cover Cisco UCS Director which is a real interest for me at the moment so I was eager to see how to best use the solution. Serge Charles presented the session and the first thing to roll off his tongue was that ‘it’s all about the applications’. As infrastructure engineers this is something we can sometimes overlook. The core of the session was looking at how to install and configure UCS Director and define the policies to build out a private cloud management solution. This was a basic overview and was aimed at those that haven’t touched UCS Director before. Serge also took apart the recently coined term ‘bi-modal’ IT. I’ve read quite a bit about this already but I really liked the way he broke it down into two modes. Initally this session was due to focus on Hyper-Converged computing across the board and how they relate to Cisco technology. Just two weeks before Cisco Live started Cisco announced the launch of Cisco HyperFlex. Due to this the content of the session was changed but could only be announced once Cisco Live began. Luckily, Chris Dunk, was one of the presenters on the Day 1 TECCOM session and he gave everyone a heads-up about the change so I was able re-reschedule my sessions. HCI is not one size fits all. It does not solve every business need. Cost savings are often over-inflated. Controller VMs handles the local storage access and interaction. The CVM (Controller VM) presents out the local disk into a single file-system pool. 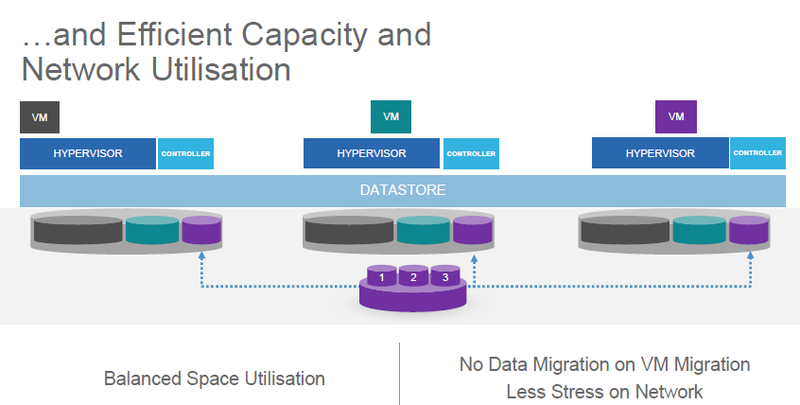 This is then presented back to hypervisor as NFS datastore. The log structure file system places newly deduped block at the end of log and updates metadata. The normal process involves reading a block and modifying the block in place following dedupe but the log structure doesn’t need this and can write directly to end of log in new location. Data is striped across disks in all nodes and even different cells on SSD to ensure low overhead on SSDs and increase performance of the HDDs. My guess is that HyperFlex is going to link into M-Series or even the C3260 for storage increases independently. Erasure coding efficiencies only really come into play at very high levels of scale so it suits object storage. It has a drawback on performance and uses up CPU cycles to bring the required levels of parity. Erasure coding can be offloaded to a hardware card to relieve the CPU cycles. This is not something that is done in HyperFlex. There’s be no CVD’s for hyperflex, it shouldn’t need one according to Cisco as it’s a simplified system. There will be solutions documents however. ESXi 6.1.0 on the box shipped from the factory. ESXi 5.5 Update 3 and above are also supported. IO Visor and VAAIr are VIBs in the hypervisor host. Compress and dedupe occurs from SSD to HDD offload. Write acknowledged immediately by SSD. No need to license the IO Visor on existing blade systems. Replication factor of 3 by default on first release but that requires 5 nodes. It’s possible to deploy 3 nodes with replication factor of 2. I’m not sure why they are pushing the larger of the two options. This was the last session in a very long day but it was probably the most beneficial to my day-to-day job. Alejandra Sanchez Garcia who used to work for Cisco TAC in Sydney for 7 years so she had a wealth of knowledge on how to troubleshoot issues. The main starting point was breaking down the issue into a fault domain and from there working out the underlying root cause issue. These domains were broken down into Compute, Networking, Storage and Programmability. Once the domain was isolated it’s then possible to drive towards finding a fix to the issue as you’re ignoring noise from other areas. Understanding the problem is the most important part. If you don’t understand it then you can’t truely fix it as it can re-occur and you’re back to square one again. Alejandra went through 3 scenarios that have been worked on by TAC and interacted with the attendees to resolve the issues. It was an interesting insight into how TAC operates and a look at what methodologies and tools they use to get to the root cause. I knew when I signed up for it that this was going to be a doozie of a session and it was mind-blowingly good. Neehal Daas had such a laid back and relaxed presentation style that it was disarming and the amount of information he dished out was incredible. I’ve always said that networking is my weakest skill in my arsenal so getting up to speed and understanding the networking components of every solution is a key focus. This session was largely focused on how the networking is split/handled within the UCS platform and how the VICs and IOM work together to create virtual interfaces from the 4 ports on the IOM. 4 x 10Gb KR lanes are available to each half width slot and 8 to a full-width blade. The IOM connects (via KR lanes) to VIC on UCS Blade. Half-width blades only use 2 x 10Gb lanes so you can get a max of 20Gb to blade. Full width can use 4 x 10Gb so they are able to utilise the full 40Gb. In 2208XP however you get 4 x 10Gb to half-width blade as the number of lanes increase due to the extra ports on the IOM. There are two potential fabric link connectivity modes, these are discrete mode and port channel mode. In discrete mode all links between IOM and FI are individual links and pinning is done on the each link. However, in port channel mode all links are grouped together as a port channel and the pinning is done on port channel. Needs 220X IOM to run port-channel mode (2208-XP is recommended). All other IOMs versions have to be in discrete mode. 3rd Gen VIC use two PCIe bus lanes and this is what gives them extra speed. See the description of Switch-Mode and End-Host mode in TECCOM-2001 – Cisco Unified Computing System above for more detail but the basic concept is that in Switch mode the FI acts like a regular switch and in End-host mode (EHM) there’s no spanning tree. EHM learns the MAC addresses only from server interfaces (e.g like MAC on vNIC on a VM) and the vNICs are pinned to uplink interfaces. This can be discrete or port channel pinning depending on the version of your IOM. In switch mode there’s no pinning on the FIs. Server vNICs follow STP forwarding states. UCSM manages the vEth pinning to uplink and pinned uplink must pass VLAN used by vNIC. UCSM periodically redistributes the vEths. 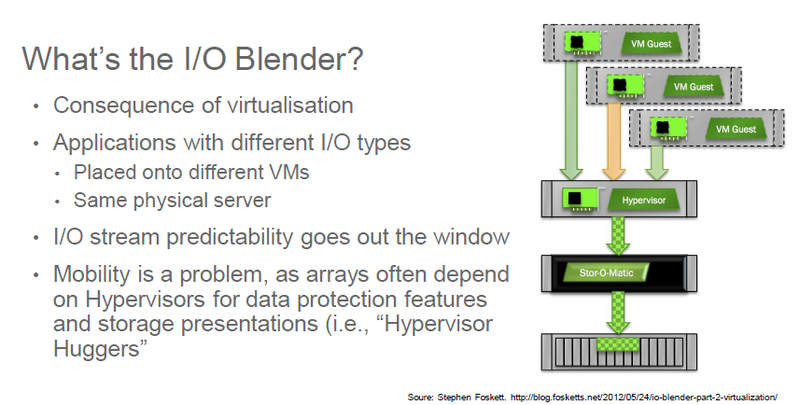 The secret sauce of how traffic is sent to the correct blade for access via a VM involves the VN-TAG. This tag is inserted into the frame and includes the source and destination virtual interfaces. Without this the FIs would direct traffic to the IOM but it wouldn’t get as far as the blade itself. Below is a diagram showing the IEEE 802.1BR structure and where the VN-Tag fits in. The VN-Tag associates the logical interface on the Fabric Interconnect to the virtual interface on a vNIC of a virtual machine. This ensures traffic can flow between the VM and the outside world. Neehal provides a number of commands to try on the Fabric interconnects to get more details about the platform. I don’t have a copy of these outputs but they are something I’m going to run within our infrastructure so I can test them out. There was also some information about the new Gen 3 Fabric Interconnects. The F6332 FI (Ethernet only) also runs FCoE. If you need to connect FC interfaces to FIs get the FI6332-UP, otherwise if you’re only accessing IP storage get the FI6332. Also, the new 3rd Gen FIs based on Nexus 9k, 2nd Gen based on Nexus 5k so it has a different ASIC and capabilities. The last session of the week was a quality one. The session attendance was small as some people had left early but they missed out on one of the most informative sessions of the week. This was presented by Brad TerEick and have a full run-down of UCSM and its components from a software level. 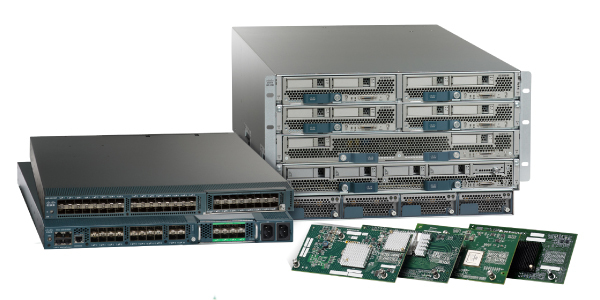 The Software Object model used by Cisco makes Service Profiles possible and provides Cisco the platform to enable stateless servers and to leverage pools and policies for management of hardware. Service Profile Templates form Service Profiles which in turn are just XML settings to define the hardware configurations. The rack servers have IMC APIs which are also quite comprehensive and they are growing over time. 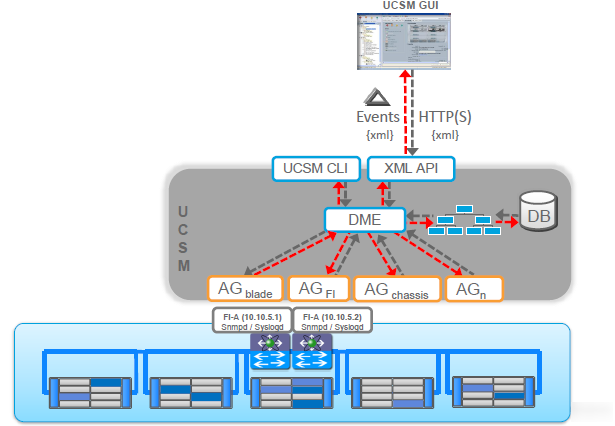 Under the hood of UCSM there are extensive XML API interfaces which integrate with the GUI and speak to the DME on the back-end. This in turn speaks to the database and the application gateways which are essentially object watchers. CIM object translation tracks state of objects and can push SNMP northbound or accept a GET command and update the DME. 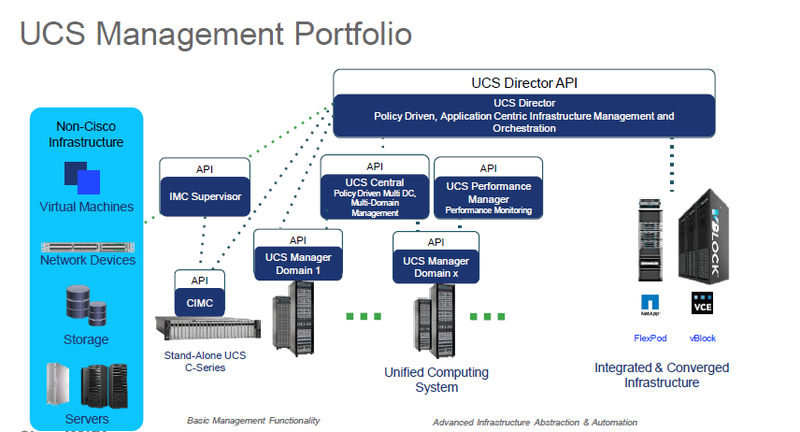 UCS Central is not an orchestration/automation tool, it’s a manager of managers. It allows for a centralised management location for a number of UCS Domains. UCS Central has it’s own database internally and it also enables a connection to cisco.com for firmware upgrades. The number 1 issue with registration is time synchronization. Make sure UCS Central and UCSM are in lockstep. You can now group domains in UCS Central (maybe by geographical location) but a domain can only exist in one domain group at a time. You can also now create sub-domain groups so there can be exceptions for different domains but most of the settings are the same for all domains in the domain group. The settings can be controlled/enforced via “System Profile”. This includes the features such as authentication, capability catalog, time zone etc. UCS domain groups are opt in/out. This means that you can choose to use UCS Central to manage the specific policies or use the local UCSM. This is something to consider in particular during upgrades. This wasn’t mentioned during the session but the steps to perform firmware upgrades are different when using UCS Central. IMC Supervisor is a centralised management tool for C-Series servers and provides hardware profile management and centralised access point. It doesn’t have any of the capabilities of UCS Director but it does look similar. Version 2.0 is right around the corner and should have a number of extra features. And that’s it, that’s a break down of all the sessions I attended. I hope someone finds this useful/helpful. I would recommend getting Cisco Live 365 access to review the sessions in your own time. The presentations are available already and the videos should appear pretty soon. Cisco are usually pretty good at getting the videos uploaded. 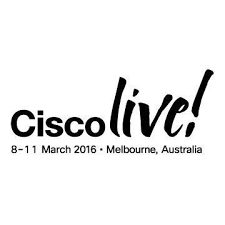 This entry was posted in Cisco, Cisco Live and tagged ACI, Cisco, Cisco Live, Cisco Live Melbourne, Cisco Live review, Community, UCS, UCSM. Bookmark the permalink.